I will add pages for the drive system, generator and body some time in the future. To open up a page click on the thumbnail photo. These pages are best viewed at 1024x768 or higher resolution. First step was the design stage. On this page I show some of the mockups I used and some of the original drawings etc. Here is some information on the frame. Basically it's just $20 worth of 2" muffler tubing (price includes bending). The rear suspension was basically cut from an old Moped and welded to the frame. 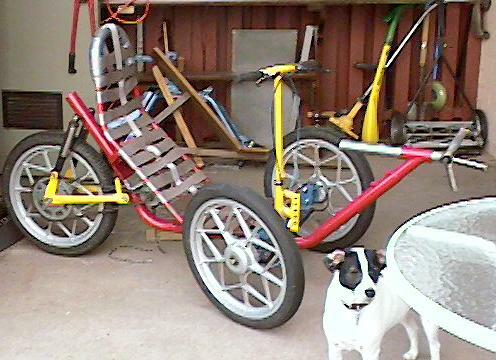 The front suspension is an old downhill ski, steering knuckles/spindles are my own design. The steering uses the head tube from an old bike and drag links to the steering knuckles.